During the course of the Battle of Verdun in February 1916, the Nieuport 11 inflicted heavy losses on the enemy, forcing a radical change in German tactic]. By March 1916 the Bébé was being replaced by the improved Nieuport 17. Thereafter the Nieuport single seat types were widely used as trainers. However, the Nieuport 11 did continue on in service in other theaters of operation until almost the end of the war. As I suspected from viewing the previous Neuport 16 a few months back, the plastic for this kit seems to be identical to the other aside from a few different colors of plastic. There are nine sprues of various sizes for this kit and as you can see, there are bits that will not be used on this particular version. The molding is quite good though I did find a couple of small sink areas on the fuselage opposite some interior detailing. There isn't much in the way of optional pieces at all, in fact I could find none. I did find that a couple of the parts had to be folded or bent in order to be used. The seat back has to be curved into shape and what I assume is a fuel tank or ammo bin has to be folded prior to gluing. Thanks to the somewhat soft plastic, this should not be a problem. The cockpit is quite complete for the scale so no one should be disappointed by the this area. Building the engine, you'll notice that it has separate cylinder heads and a complete set of push rods. The ending is designed to be mobile if one takes care inconstruction. The rest of the kit is quite straight-forward in its construction. The kit has some very fine injected pieces instead of using photo etch, so care needs to be taken removing the parts from the sprue. Instructions are for the box art aircraft with a camouflaged upper wing and fuselage. There are color references throughout in Humbrol paint numbers. The very small decal sheet is well printed and matte. Since the wings are in red, white and green, there will be plenty of painting opportunities for the builder. There is no information on whose plane this is aside from it being Italy in 1918. However, a look through Osprey's "Italian Aces of WWI" shows it to be the aircraft of Sergente Alvaro Leonardi from the Spring of 1917 in the Adriatic. The profile in the book also shows that the cowling was segmented into green, white and red, whereas the kit instructions show it as being overall red. However, this particular aircraft was used on home defense duties over Naples as late as March 1918, so it is possible that after it was no longer on front line duties, the cowling could have been repainted overall red. 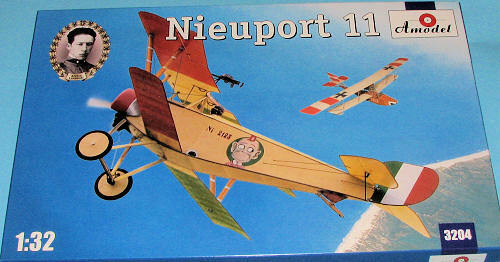 As I commented in the previous Nieuport 16 preview, this is a very nice kit. You have all the bits and pieces you need to successfully build a nice and well detailed model. My thanks to www.scale-model-kits.com for the preview kit. Get yours today at the link and at a discount.